POROLAY LAYFOMM 40 is best characterized as foamy and highly porous. This material is made from a rubber-elastomeric polymer and a PVA-component. 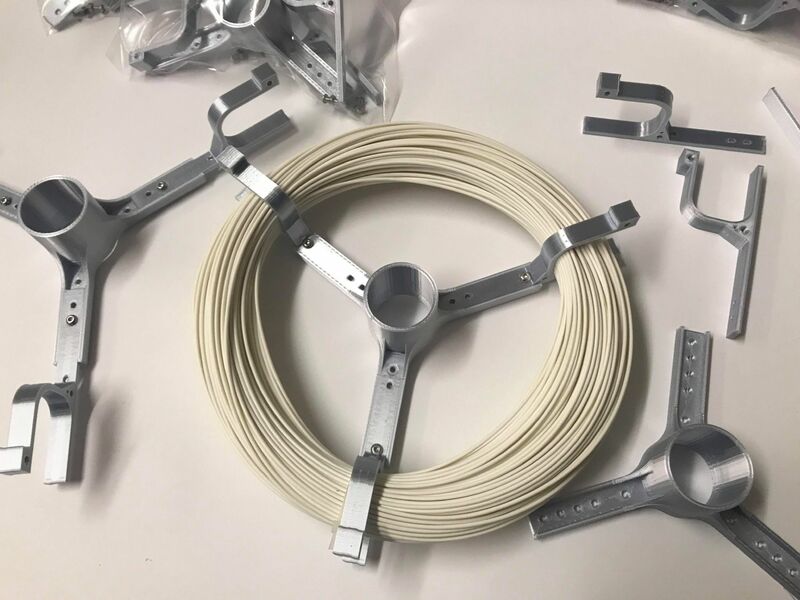 If you need a spool holder for this product you can either download and 3D print your own from here https://www.thingiverse.com/thing:39564 or add one to your order during your spool selection of which we have already printed for you at just £3.50 per holder. POROLAY is the name of a brand new series of 3D printer filaments. This new revolutionary line consists of foamy, felty filaments with a porous structure. With this filament you can build porous flexible objects. The POROLAY line consists of four different types of filaments: LAY-FELT, LAY-TEKKKS, LAY-FOMM (40 & 60) and GEL-LAY. 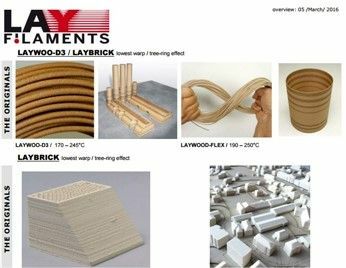 LAY-FELT and LAY-TEKKKS are similarly felt-like materials, though LAY-TEKKKS is thinner and more fibrous. LAY-FOMM and GEL-LAY are foamy and gel-like respectively. The composition of the POROLAY filaments consist of two different materials; a functional component, for example an Elastomer (i.e. a rubberlike) and a soluble component (e.g. PVA, sugar, salt, or soluble resins). Note: the POROLAY filaments are specially designed for experimental use by experienced users. POROLAY LAY-FOMM 40 is best characterized as foamy and highly porous. This material is made from a rubber-elastomeric polymer and a PVA-component. That means that part of this filament is water soluble. Once you rinse this material in water, the PVA component dissolves and the rubber polymer remains as your micro-porous object. LAY-FOMM 40 feels like soft rubber with holes and is therefore ideal for printing soft rubber-like objects, such as bendable suits and sponge-like objects, ink-reservoirs, bio-cells, micro-foam and elastics. Your object printed with LAY-FOMM will feel strong and rigid but after rinsing the print with water the object becomes micro-porous & elastic. This makes it very suitable for printing soft and flexible rubber like objects. 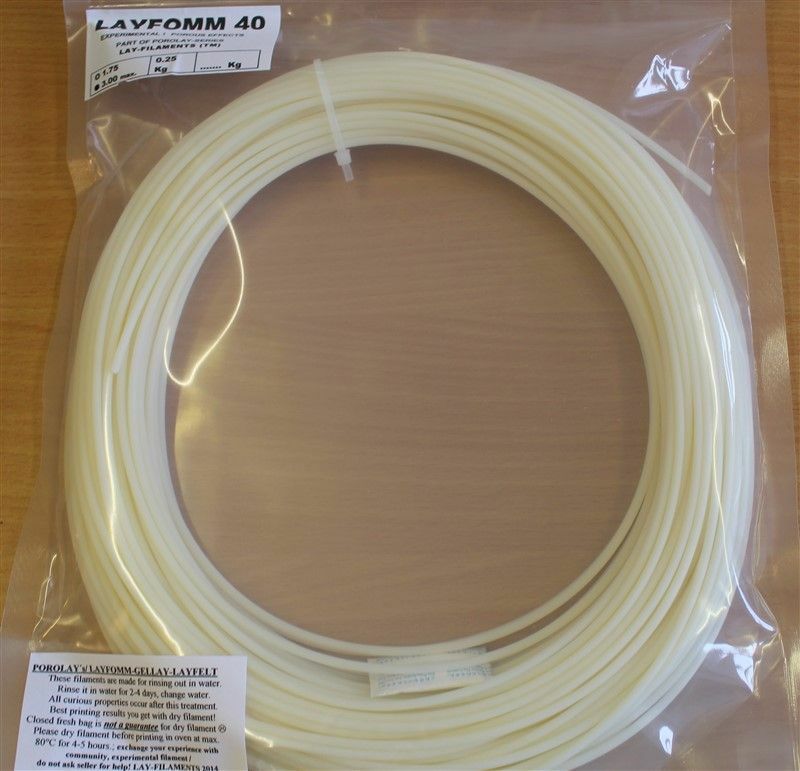 The LAY-FOMM 40 filament is very soft and has a shore hardness of A40, it is slightly softer than LAY-FOMM 60 which has a shore hardness of A60. For the best result of maximum flexibility of the printed object we recommend to immerse the print in a basin of tap water for 1 to 4 days. - Printed objects are hot-sealable after drying; after rinsing the material the (PU) remains as your object. 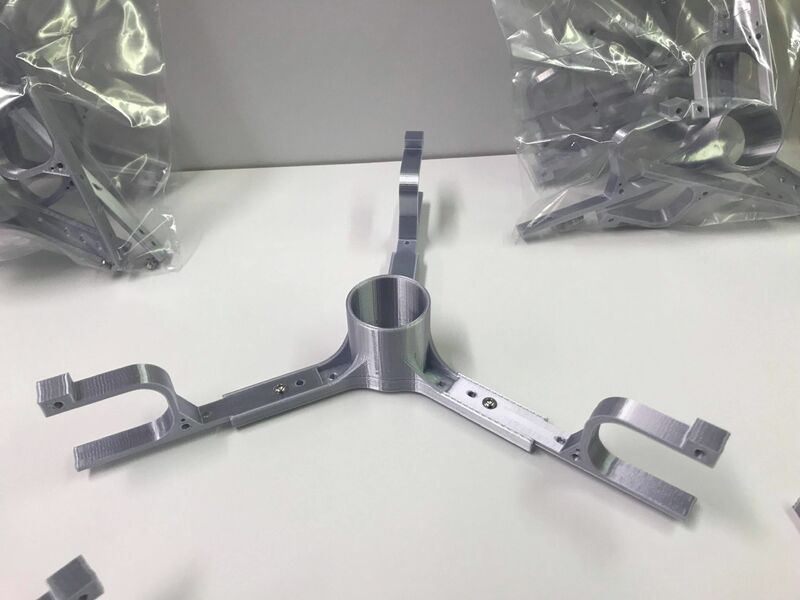 This PU is a Thermoplast and all Thermoplast are hot sealable which means, when you make them partially hot, stick both parts together, let them cool down, they are now sealed together (as glued together).